While finishing a delicious bowl of Sopa Azteca the other day at Café Mayapán, I ran in to Arturo and Vallarie Enriquez of Vantage Point Studios. 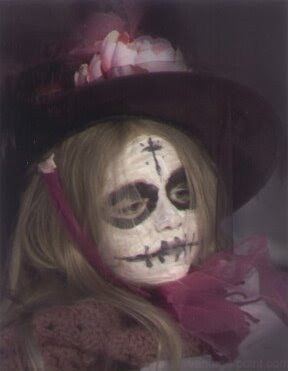 Art reminded me that he had taken a few photos of my daughter and me at last year's Dia de los Muertos celebration at Centro Mayapan, and sent them to me a few days later. Thanks to Vantage Point for allowing me to share the photos! Give Vantage Point Studios a visit! They're one of El Paso's finest! 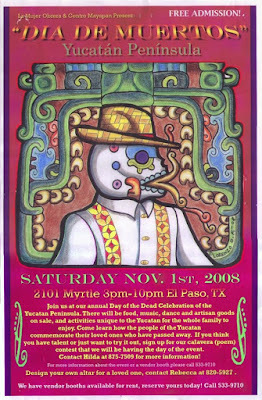 Here is the poster for Centro Mayapan's Dia de los Muertos 2008 celebration here in El Paso! A Dia de los Muertos fragrance? Yes at Black Phoenix Alchemy Lab. 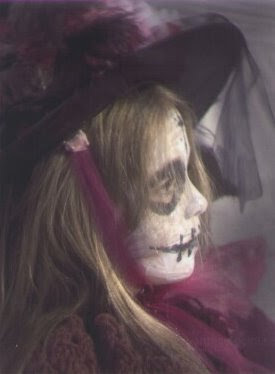 candies, chocolates, foods and tobacco of the ofrenda, amaranth, sweet cactus blossom and desert cereus." 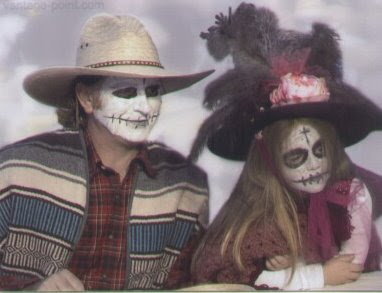 I haven't visited there yet, but it seems completely appropriate for the Dia de los Muertos - El Paso website! 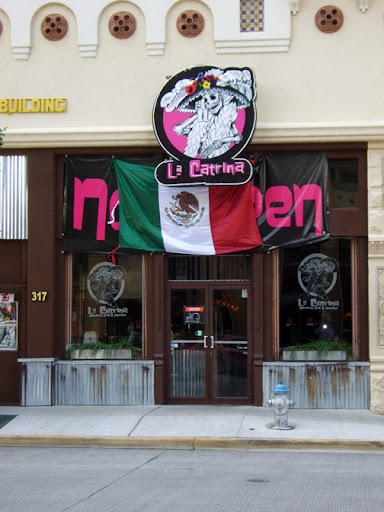 Right across from my office is the new La Catrina Mexican Grill & Cantina (317 East Mills). Cool artwork on the front of the place! 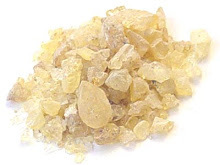 I recently received an email about where to find copal resin in El Paso. Of course, incense is easy to find, but copal is another story. First, a little about what copal is. Copal is a resin (dried sap) of the copal tree, which is more common in southern Mexico. 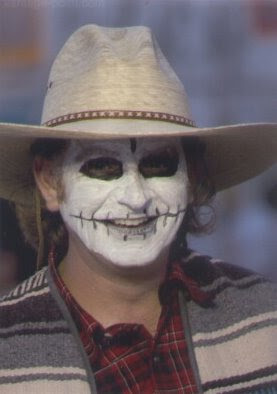 This resin is often burned on ofrendas (altars) during Dia de los Muertos. The word copal is derived from the Nahuatl word copalli, meaning "incense." The resin can come in many forms; milky white, black and the most common, pale yellow. 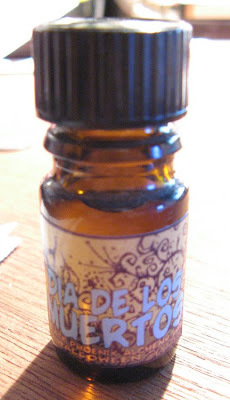 Copal's fragrance imparts a very smoky, cedar aroma. I absolutely love it, but many find it oppressive. Copal resin is most typically burned on little charcoal burners, which are available at virtually any store that sells incense. (A foil-wrapped tube runs about $2-$3 for ten burners). Copal incense can also be found in stick and smudge form, although they do not impart the genuine qualities as the resin. It tends to have a sweeter smell. Copal resin can be found at the following places in El Paso and surrounding areas. These are the only ones I know of, but would appreciate it if readers could drop me a line if they discover it somewhere else. Be sure to call first to see if these places have it in stock.